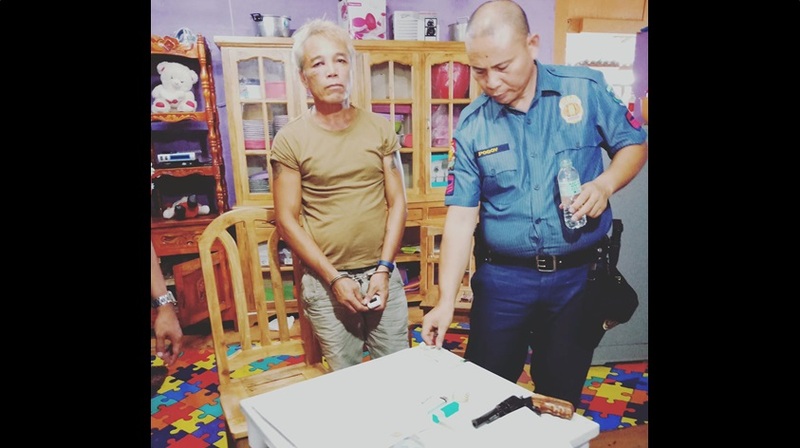 A 51-year-old man was arrested for possession of illegal drugs and firearm in a raid conducted by police in Dauis town at dawn on Monday. According to Dauis police chief Sr. Insp. Gerard Luna, the raid was carried out after some residents in Purok 3, Barangay Totolan of said town complained that the suspect, their neighbor, has been indiscriminately firing his gun. Luna identified the suspect as Vicente Pancho, 51, a resident of Barangay Totolan. Police operatives raided Pancho’s residence at 5 a.m. bearing a search warrant issued by Judge Suceso Arcamo, executive judge of the Regional Trial Court Branch 47 in Tagbilaran. Authorities allegedly found in Pancho’s kitchen a fully loaded .38 caliber revolver and eight packets of suspected shabu hidden inside a cabinet.